Stew is comfort food in Korea, and this spicy Korean soft tofu stew (soondubuchigae) doesn't disappoint. It's filling, warm, and quite popular on the menus of Korean restaurants. Like many Korean stews, soondubuchigae can be adjusted for different spice levels and flavor preferences. Vary your kochukaru (red pepper powder) according to your taste and your spice level preference. 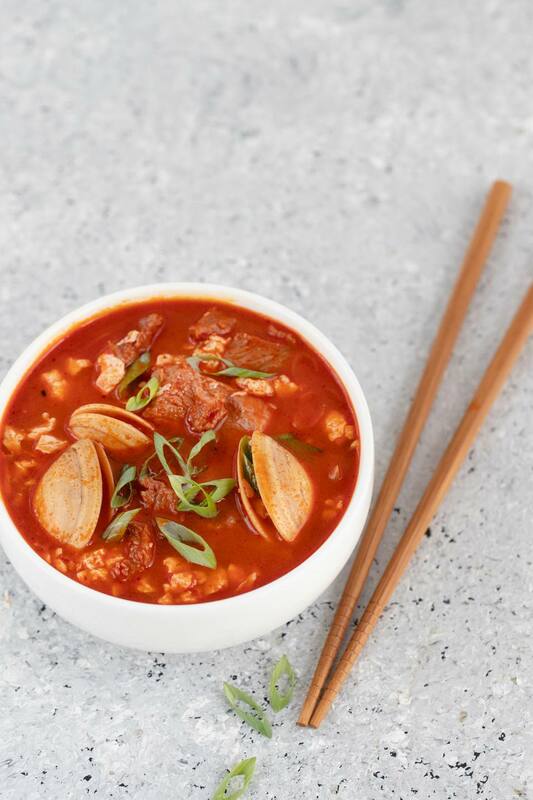 Spicy Korean soft tofu stew traditionally calls for soft uncoagulated tofu, which has a higher water content than firmer varieties of coagulated tofu (which are made more firm by pressing more water out of them). Soft, uncoagulated tofu normally is sold in tubes in Korea and in Asian markets in the United States. If you're unable to find soft uncoagulated tofu, you can substitute soft or extra soft silken tofu. In a soup pot, stir-fry the beef, garlic, and kochukaru in the sesame oil for about five minutes. Add anchovy or beef stock or water and soy sauce to the pot. Add soft tofu and return to simmer. Add clams and simmer until the clams are cooked, about 10 minutes, until they shrink, or until the shells open (if using unshucked). Add scallions and take off heat. This tofu stew can be made completely mild to very spicy. we've listed a medium amount here. Soft tofu stew with no spice is referred to as 'white' in Korean restaurants (for the color of the stew, not the people who eat it). Uncoagulated tofu is usually sold in tubes, but you can use silken tofu if you can't find the really soft stuff. Just slice it into small cubes and cook as directed.